It's all led to this. Issue eleven isn't called 'Judgement Day' for nothing. Mia Goodwin and Michelle Wong deliver what feels like an epic conclusion to the series, tying up story lines that have made up this run. Whatever comes next, 'Tomboy' has been an exceptional nail-biting fantasy thriller. If you've followed 'Tomboy' from the start as I have this issue is thoroughly satisfying, shocking, and rewarding. If you're new to the series or to this issue you may still find it compelling but without the full context of the entire story. I highly recommend catching up by picking up trade paperbacks Volume 1 and 2 in order to feel the full impact of this issue. With that said, the proceeding will have some spoilers. The courthouse becomes ground zero for this apocalyptic chapter that brings Mark, Irene, Warren, Addison, and Grandpa together in a cataclysmic showdown. To say things get tense would be an understatement. Mark orders his father to lead him to Addison at gunpoint, Warren is holding Irene Trent hostage at gunpoint, and Addison is bloodthirsty for revenge. Without giving too much away it all comes crashing down like the end of early Tarantino films. Midway through the issue, Irene finally spills the beans and through a mesmerizing exposition dump, she describes the history of the Branch that has brought her to present day. What transpires during those last pages will leave you with your mouth agape and your heart racing. What's most striking is the character arc, the transformation that Addison undergoes from the start of the series to this issue. Once, a regular teenage girl with dreams and thoughts of her own to a sullen killing machine possessed by a deadly family secret. This twisted take on the magical girl trope is at first quaint and empowering but slowly revealed more as a curse with an unhealthy desire for vengeance at any cost. Addison has lost so many people in her life that by the end she's numb with only the ghosts of her friends to console her. It's sad but also so invigorating to see Addison avenge the murders of those close to her that have haunted her for eleven issues. Addison becomes an anti-hero, a melancholy warrior, who loses everything during her journey. It is soul-crushing and yet the proper conclusion. Since Wong took over the art duties from Goodwin the series hasn't lost a beat. Wong's sharp lines and dynamic layouts have produced a synergistic relationship with Goodwin's script. There are panels in this issue and throughout the series that hit emotional notes that often are heart-wrenching and devastating. Wong gets maximum effect from a single expression or a sequence of movements in body language. It should also be noted that her versatility allows her to create some kickass scenes of dismemberment too. She can do it all. 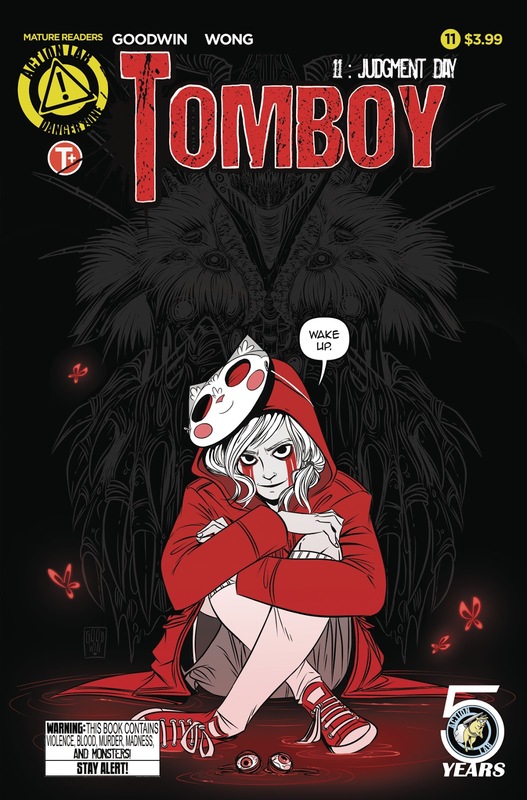 'Tomboy' #11 is a gift to readers who've followed Addison's supernatural adventure to the bloody end. It's a hidden gem of a series that deserves more eyeballs. Goodwin and Wong have redefined the magical girl genre with a dark, stunning, and savage tale. 'Tomboy' is a winner. Pick it up, tell a friend, talk about it, share it, let people know just how awesome this book is.